Zugzwang's Last Move is a Tactical type weapon. Throughout the years Wizard Zugzwang's creations have been spread across the Gnawnia Kingdom, being traded between experienced hunters and trapsmith. Zugzwang enchanted the pieces of his chess set to create a trap weapon capable of combating the clever mice in his tower. The pieces of this weapon come to life when a mouse approaches the trap's bait, the battle that follows is quick and decisive. Zugzwang's Last Move can be purchased for 415,000 gold from Training Grounds and Seasonal Garden Trapsmiths. It refunds for 74,700 gold at both locations. Zugzwang's Last Move (if unintentionally smashed) can be reassembled from Chess Pieces. 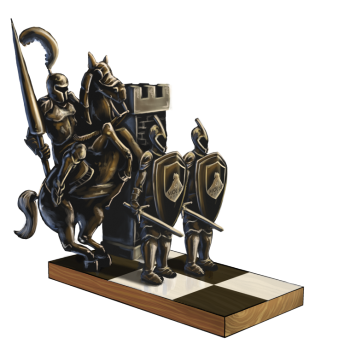 Zugzwang's First Move – Requires Chess Pieces for crafting. Smashing this weapon with the Hunter's Hammer yields Chess Pieces. 17 November 2008: Zugzwang's Last Move was introduced. The name of Zugzwang's Last Move comes from the term zugzwang which, in the game of chess, is when a player must move into a disadvantageous position. This page was last edited on 13 January 2019, at 15:53.